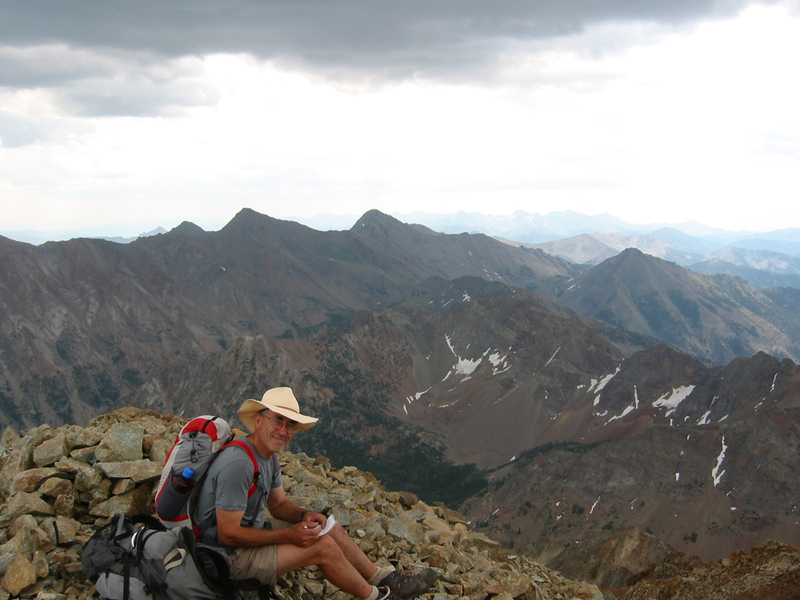 We climb seven peaks in four days, making almost a complete circle around the White Clouds. Plus a high peak in the Boulders. Art said he wanted to bag some summits. Coming from Art, this seemed a little unusual, but I was glad to oblige. Note that in the ensuing five days, I took almost 120 pictures. Even if I posted them all, they could not do justice to the beauty of this trip. On July 4, we met in Lowman and after moving Art's gear into my rig, we drove for a couple hours to a campground at the start of the road into the East Fork of the Salmon River. We were the only campers. Strange. We got up early the next morning and drove to Livingston Mill on a pretty good road with a few loose rocks, but suitable for any car if driven carefully. Only two cars at the trailhead. Strange. 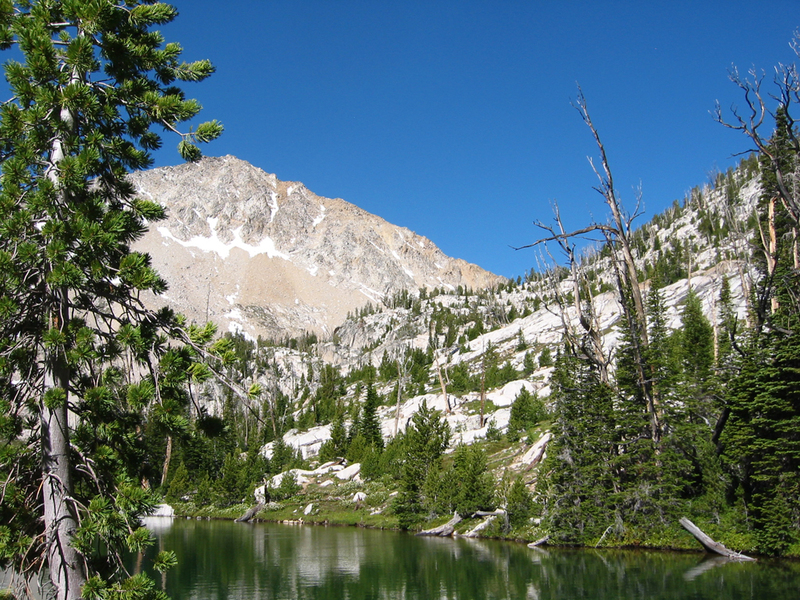 Our first objective was Island Lake, about 7 miles away. 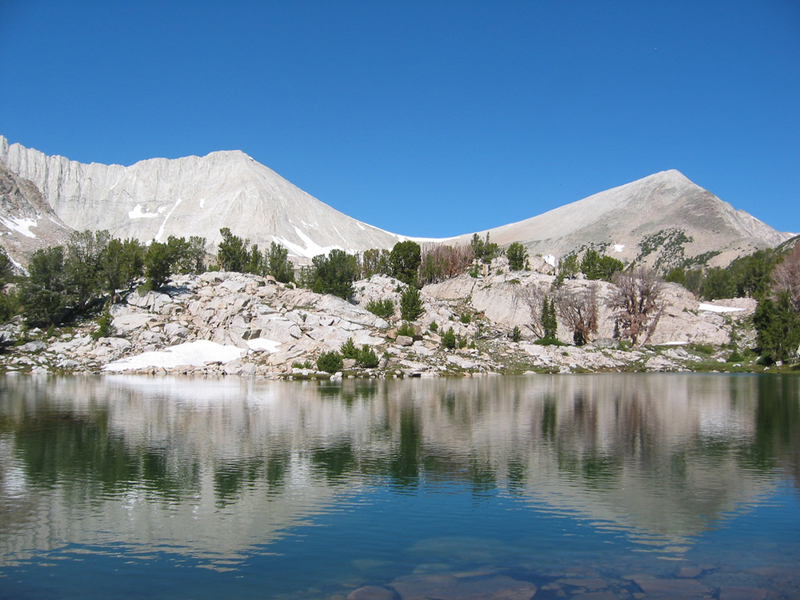 At Island Lake, there are some great camping spots and this great view of Peak 11272. The trail ends here, so we bushwhacked up through the slight saddle located (in the picture) just where the ridge of 11272 meets the hill above the lake. 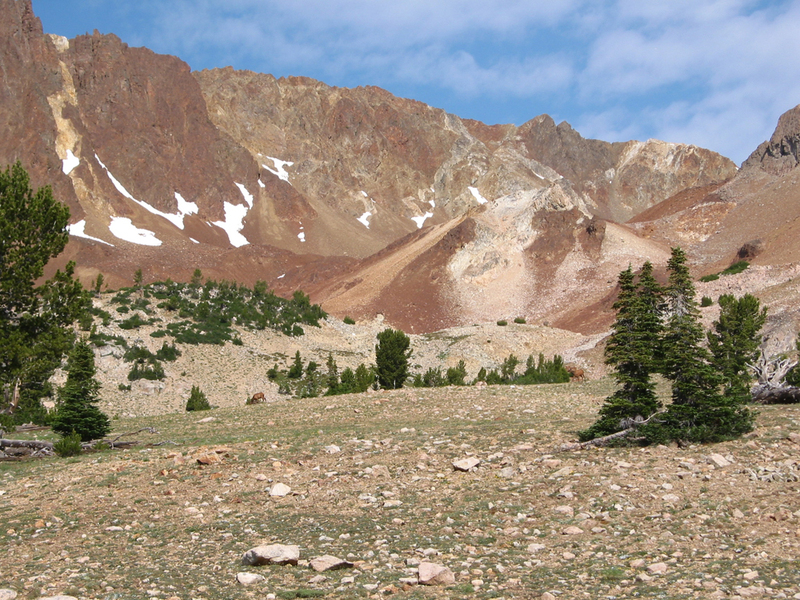 The 1-mile bushwhack brings you into Big Boulder Lake Basin. Elapsed time from the car was 4 hours. 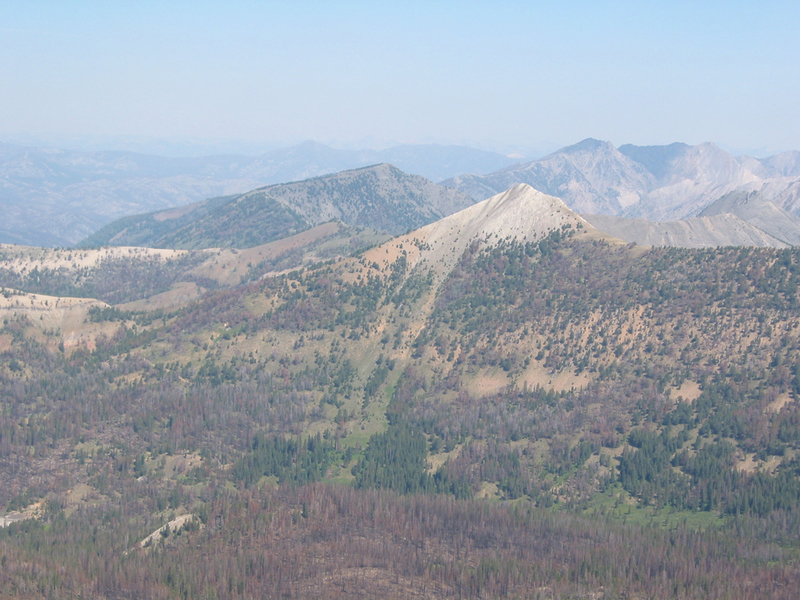 The two peaks are D. O. Lee on the left, WCP-9 on the right. We walked around for about an hour, stunned. There are lakes all over the place with granite outcrops separating them, and the views made us stumble as we forgot to watch our feet. From a million wonderful camp spots, we finally picked one, and this picture was taken where we pumped our water. Camp was on a bluff above the lake. Not another soul in sight. Strange. Good thing the view was so nice, because the mosquitoes were annoying. 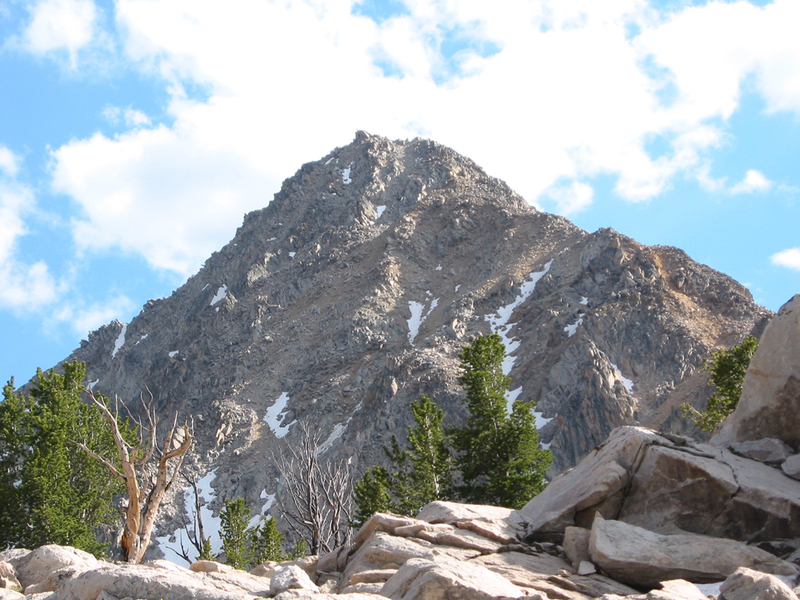 At about 1 o'clock, we decided it was time to go climb Peak 11272. The route follows the right-hand ridge line. It's rocky and loose, but not difficult. Class 3 with easy route finding. We galloped up in about an hour, but the terrain was such that it took us just as long to get down. 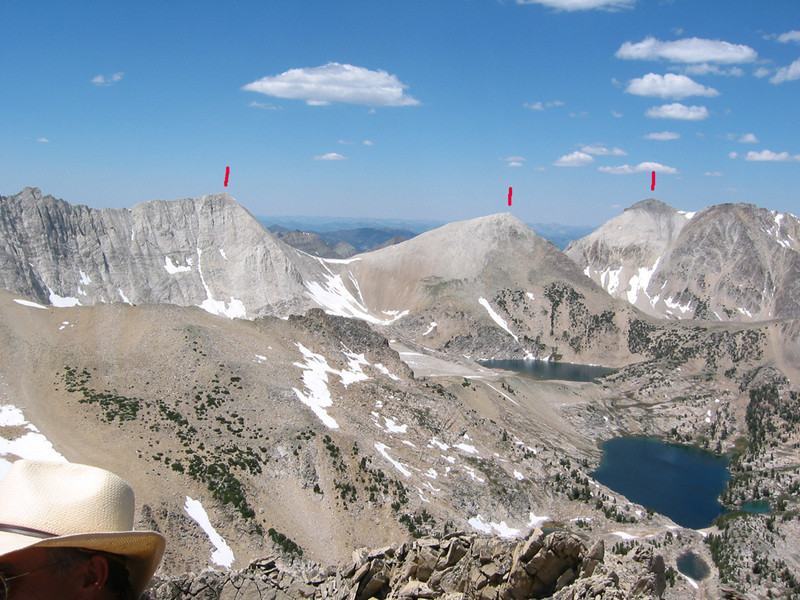 From the top, we could see our next objective: Caulkens Peak on the right, WCP-9 in the middle (WCP = White Cloud Peak), D. O. Lee Peak on the left. But we would let that wait until the next day. In the mean time, we went for a swim... or at least a dip- brrrrr! We tried to convince ourselves that freezing our body parts would help them recover faster from the day's efforts. Then we had a delicious dinner with perhaps a little too much wine, and hit the sack. 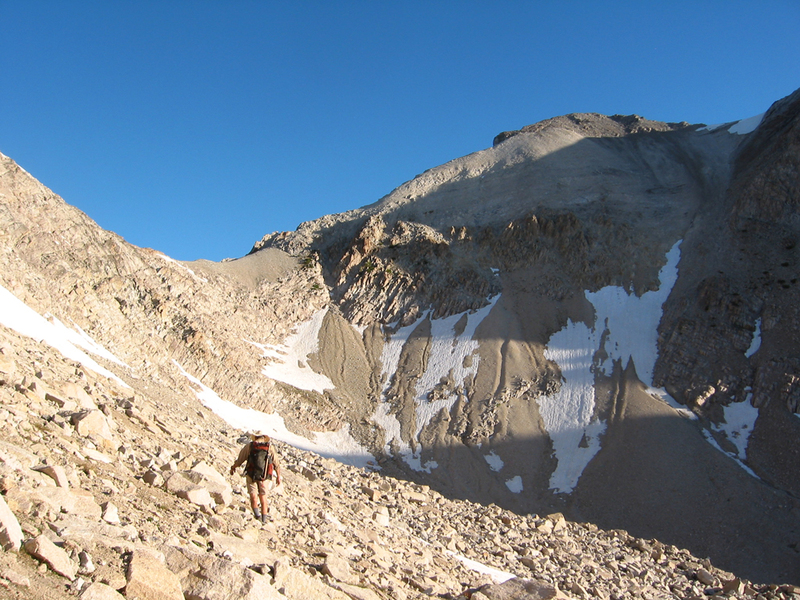 The next morning, another alpine start got us near the saddle between WCP-9 and Caulkens before the sun was completely up. The climb to the saddle wasn't too bad, but definitely Class 3. 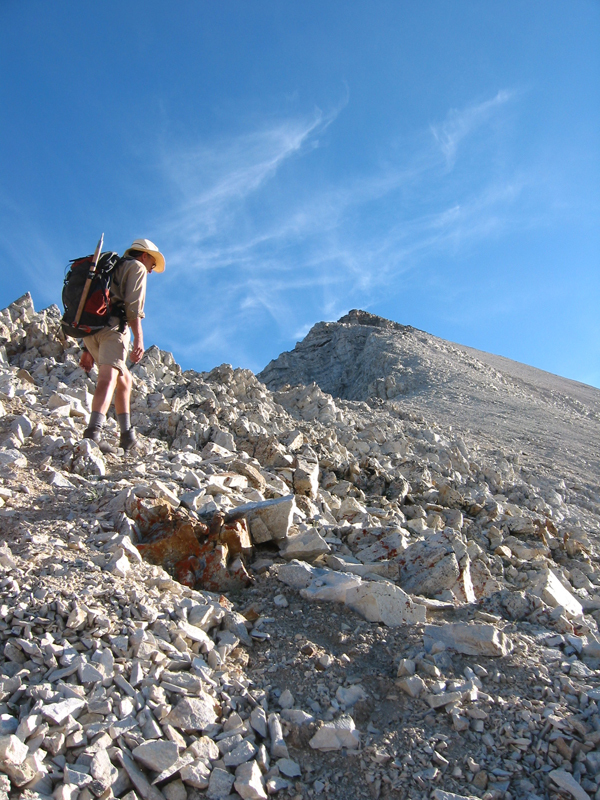 Of many options, we followed the scree cone up to the bottom of the shaded gully and then traversed to the saddle to pick up the goat trail. From the saddle, it's scary looking, but the goat trails make it only Class 2 to the top. But those goats chose some of the steepest scree I've ever seen. We hit the summit in two hours from our camp. 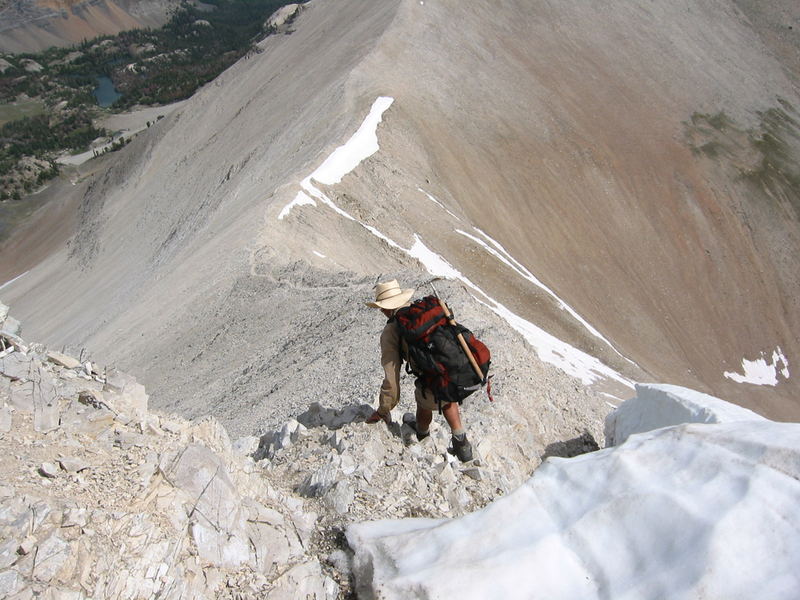 Not many people climb Caulkens, so Art was surprised when I recognized several of those in the summit register, like my friend "Summit Dawg". After marveling at the view, we headed back to the saddle. It may be that there was an easier route up WCP-9's north ridge somewhere, but the snow patches forced us to some exposed areas. And we did have to cross one very steep snow gully. We rated the lower portion of the ridge Class 4. Above that, it was steep Class 2. It took us one hour from the top of Caulkens to the top of WCP-9. We finished the last 100 feet on the east ridge, which looked to be an easy climb. 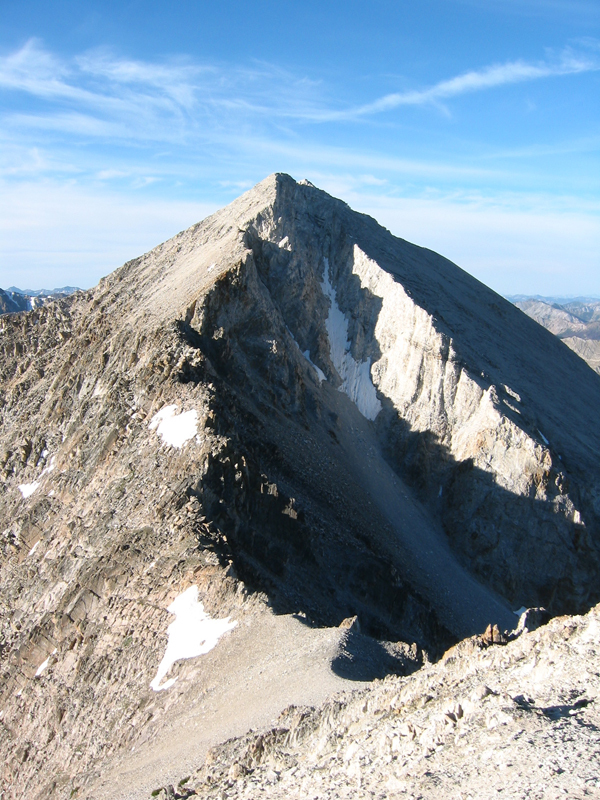 From WCP-9, it's an easy scree walk down the south ridge to the saddle leading to D. O. Lee Peak. It took us 37 minutes to go from summit one to the other. From camp to the top of D. O. Lee, our elapsed time was 5 hours. Being philosophical-type peak baggers, we discussed rating systems and timing at great length. Art's watch allows him to calculate rate of ascent and other trivia, so he measures the time we actually climb, and doesn't count the rests. I only like to know the total time- probably because I have a cheaper altimeter, or the smaller brain. I'll try to be specific here when I mention times. On D. O. Lee, we signed in once again, and then is was time to head back to camp. Until you are just below the summit, it's Class 2. The last 30 feet of the ridge is Class 4. We got back to camp in about 1 1/2 hours, for a total loop time of 6 1/2 hours. 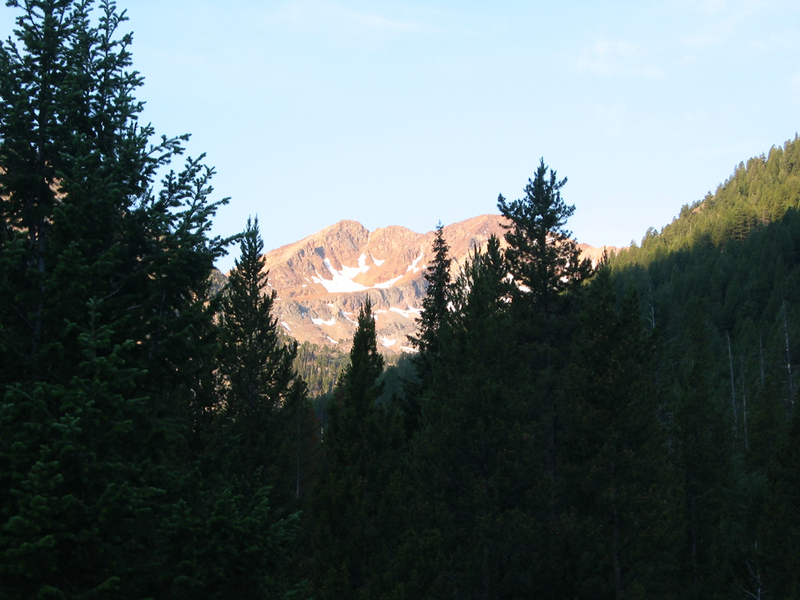 Then it was 8 miles back to the car (3 1/4 hours), and a drive to the end of the East Fork at West Pass Creek. Something to remember: from the time you can see Liviingston Mill until you reach the car, it is a longggg walk. Or so it seemed. If you are doing the math as we go along, you can see these were long days- this one involved almost 10 hours of walking. 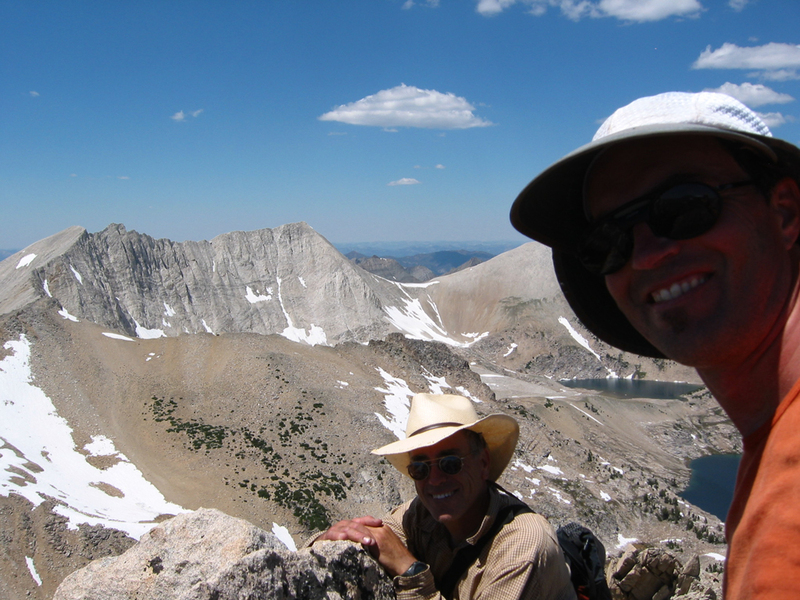 Art had wanted to climb Glassford Peak ever since we climbed Ryan as teenagers.... back in the pleistocene. So after a lot of "discussion", we finally agreed on two things: it was only about 15 miles to the northern approach versus about 100 through Stanley and over Galena summit to the southern approach. And the southern approach was likely to be crowded with Sun Valley tourists. So we went for the northern approach. The first 100 yards up West Pass Creek were bad- rocky, loose, rutted, and the Suby could have used a low range. But then it was just fine to the end of the road (not really the end, but the point where the old mining road has been closed to motor vehicles because the creek washed out the road, requiring a creek crossing). At the end of the road, we found a wonderful grassy campsite with lots of flat area and the creek nearby, and not a soul around. Strange. And this time, hardly any bugs! 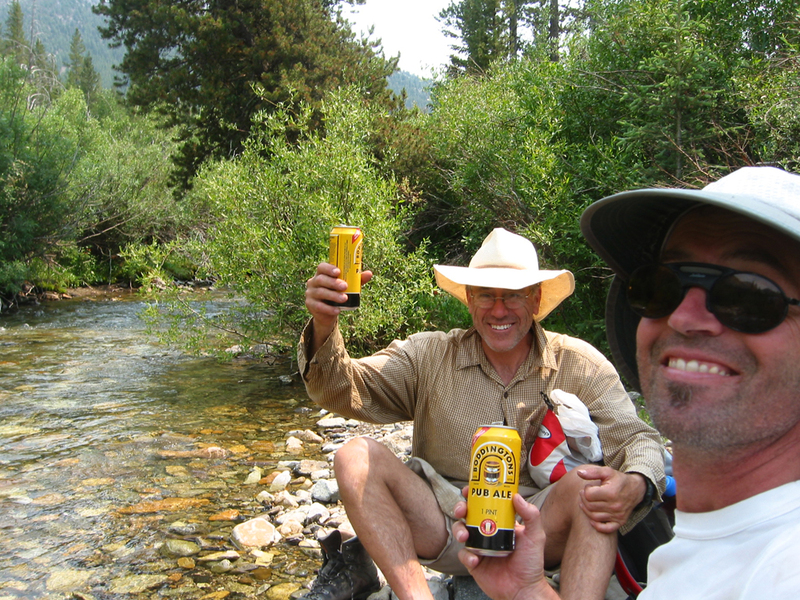 The next morning, a short walk brought us to the creek crossing, where we stashed some beer in the creek before wading across. Then on up the old road we went, finally getting this brief glimpse of the summit. The excellent condition closed/abandoned road made us wish we had brought our mountain bikes. We had read and re-read the route description in Lopez's book. If we had only read the route description, we might have been fine. But the access information at the back of the chapter confused us. So we just looked at the map and went our own way. And we walked some wonderful terrain that we might have missed, like this grass and wildflower-filled valley. The upper basin was a little confusing because you can't see the summit from here. Not even from the little striped cone (that shows up on the topo). But if you click on the picture, you'll see there are elk right in our path. 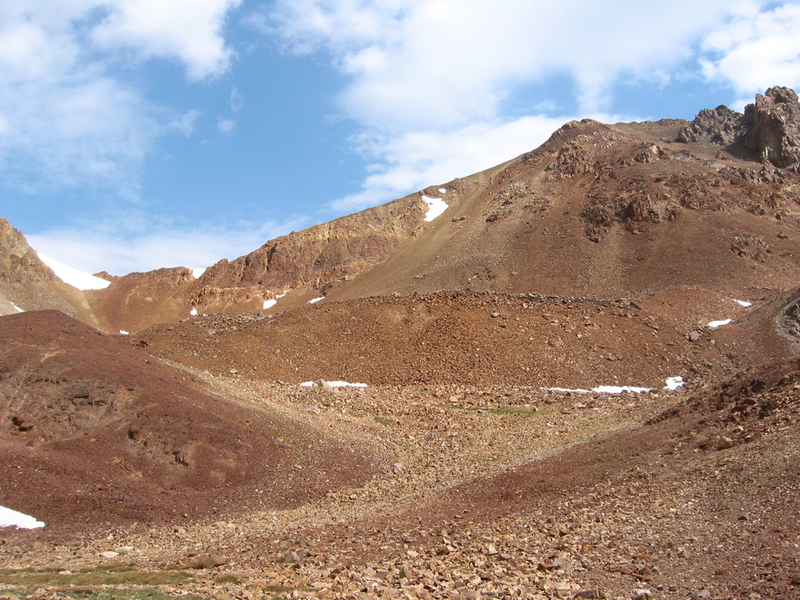 From above the little cone, you can see the snowy saddle on the left, which is your next goal. You have to love Idaho climbing. 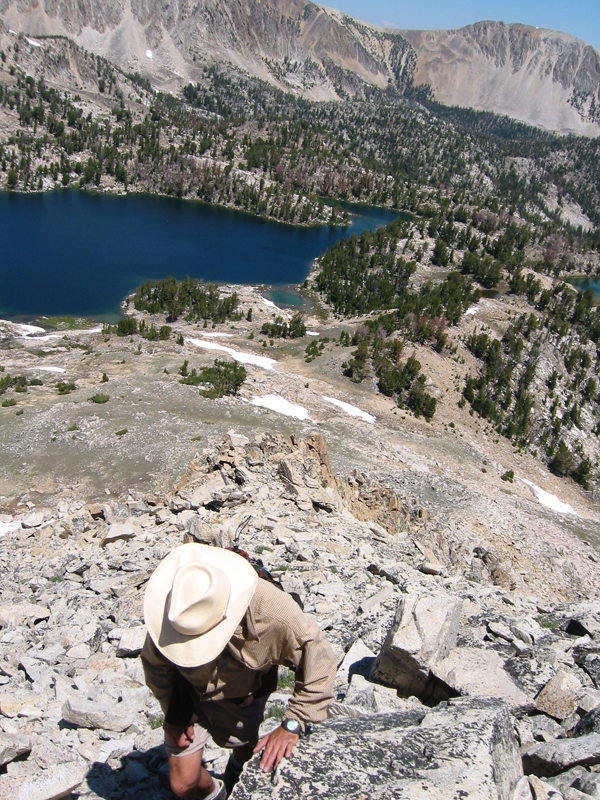 This last 800' above the saddle is amazingly loose talus. You have to love it because that 800' is going to be with you for a while. Slippin and slidin at 11,000 feet. 30 years later, and 5 hours from the car, Art finally made it up Glassford. He was all sunshine. But the sky wasn't- the clouds were getting darker so we skipped the planned celebratory lunch on the summit. We dropped 1500' in less then 20 minutes, and that is about when the bolts started off over the Pioneers. Yikes! Thanks to good scree-skiing skills and a few patches of snow, we made good time descending, getting down to safety and some herring canned in lemon and cracked pepper. Yum! Then we cruised back down the valley and found the road home. When we got back to the creek, we crossed it again, and once again froze some body parts. Through scientific deduction, we found that the creek must have been exactly 41 degrees. That's the temperature recommended on the Boddington's can as providing the best flavor, and it sure did taste good. Then it was off to Stanley for some grub. 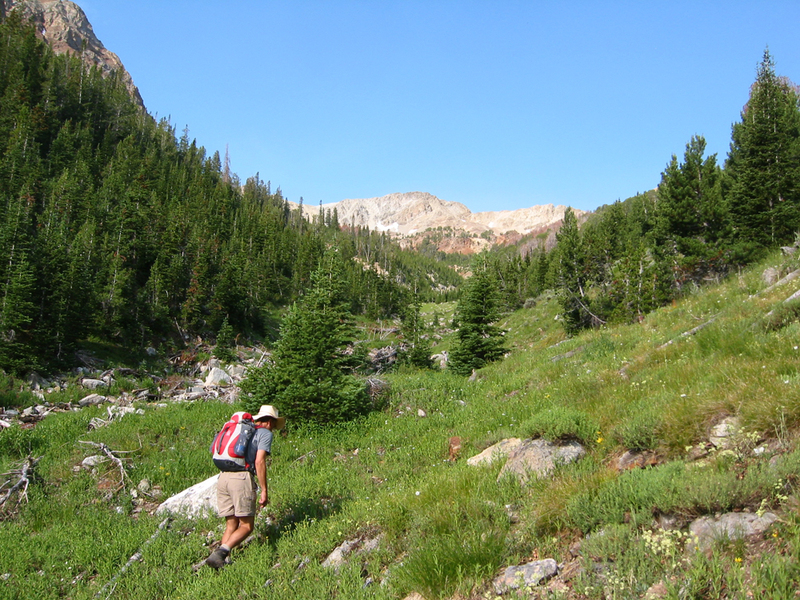 After dinner, we camped in a meadow up Fourth of July Creek. The next morning we got another alpine start. I had some unfinished business in the area from a trip last fall, and there were two peaks in the area that neither of us had done. 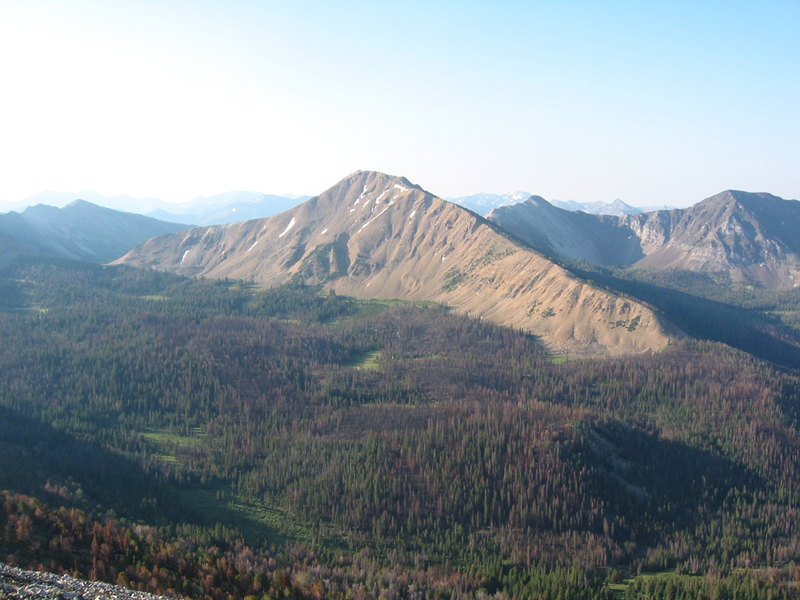 So we first walked up Blackman Peak. 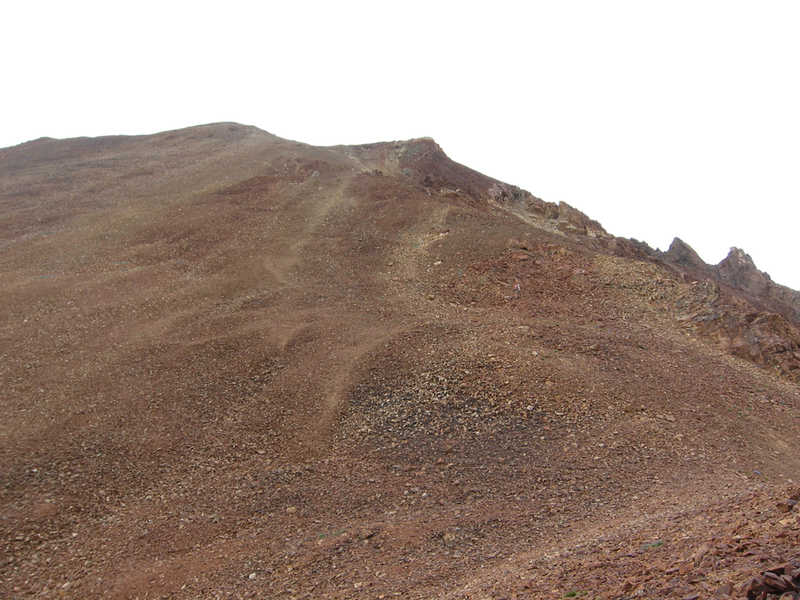 We went up the old road to the left ridge, hitting the summit in about 1 1/4 hours. 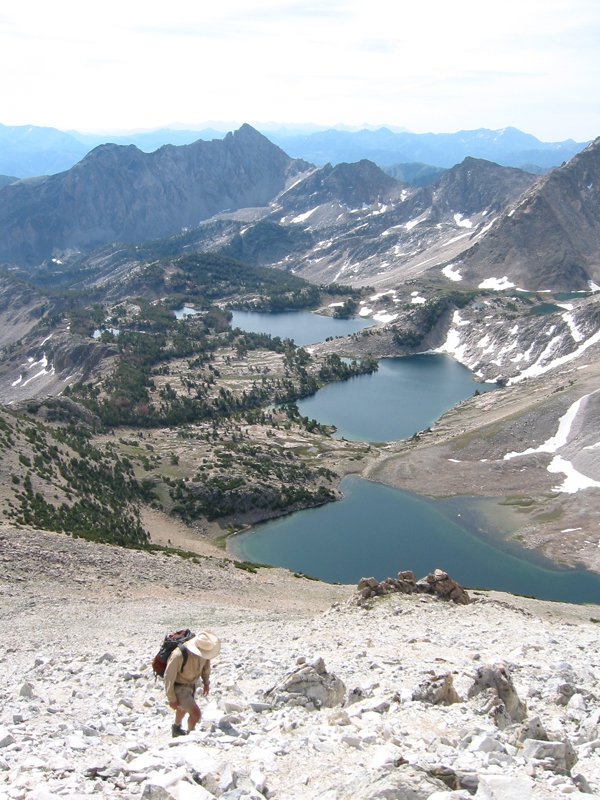 Then we traversed over the summit, down a rough trail on the east ridge to the pass to Ants Basin and followed the real trail to Fourth of July Lake. Our second objective was Fourth of July Peak. We climbed the left ridge and hung out on the summit for a while, avoiding the wind while we ate lunch by hiding in the summit rocks. Then we descended the right ridge, ending up right back at the trailhead for a great loop. When we hit the road leading back to the trailhead, we still hadn't seen anyone all day. Strange. From the pass to the summit in about 45 minutes. Car-to-car was just about 5 hours. 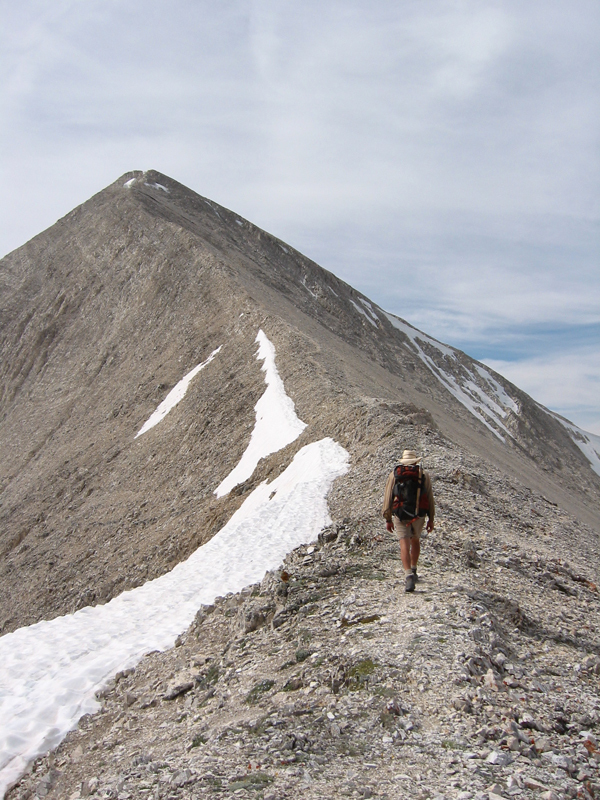 Throughout the long weekend, we had seen some great views, like three sides of Castle Peak. Different angles of each of the many peaks we climbed. And lots of other stories... The three bull elk. Jerry's mom and sister in Stanley. The unconscious motorcyclist. The note on my brother's rig, who was in climbing Castle Peak with his son (congrats, bro!). Flushing the elk calf at about 30 feet. The bold and proud pronghorn. But I fear I have already put you to sleep. Suffice it to say that Art's desire for bagging peaks was fulfilled.